There aren’t too many vegetables, in my opinion, that are more refreshing than a cucumber. We eat cucumbers in some form with dinner at least twice a week, usually in a chopped salad…sometimes grated and mixed in yogurt for a nice raita. Cucumbers pair nicely with the spicy cuisine of Pakistan that we eat so often in our little house. I love leafing through Indian cook books looking for inspiration. I took out the beautiful cookbook Mangoes and Curry Leaves by Jeffrey Alford and Naomi Duguid from the library because I had heard such great things about the book. It is loaded with fantastic photography and tempting recipes from the Indian sub-continent. If you never heard of or seen this book and are at all into cooking or learning more about Indian food, then you should track down this book! A recipe in the book for a spiced cucumber salad immediately jumped out at me as something I had to try. 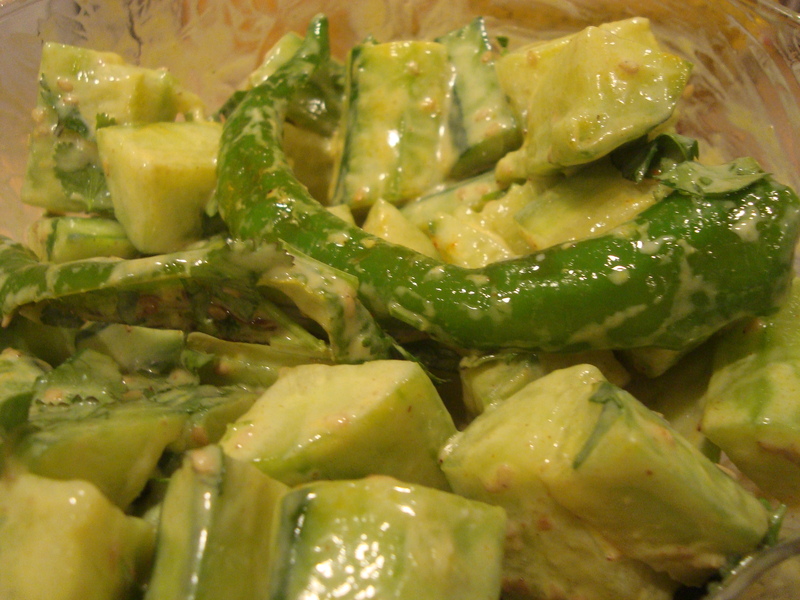 It is a salad made of chopped cucumbers tossed in a spiced mustard oil and yogurt dressing. I altered the recipe to work with the ingredients I had on hand instead of running out and buying some additional spices. The end result is still very impressive. Cut cucumbers into quarters lengthwise and then cut again into 1.5 inch long pieces. Put cucumbers in a strainer/colander in the sink (or over a bowl) and sprinkle with 2 Tablespoons of salt. Let sit for 15 minutes. Meanwhile, in a heavy skillet, dry roast the sesame seeds until golden. In a small bowl, mix sesame seeds, cumin, and yogurt to make paste. Set aside. Rinse cucumbers with cold water. Squeeze them gently to get out any excess water. Put cucumbers in a bowl. Add spice paste to cucumbers and rub all over to coat them. Set aside. Heat mustard oil in skillet over medium heat. Add the green chili and cook for about a minute, stirring occasionally. Add the cayenne and tumeric and stir. Pour the flavored oil over the cucumbers and toss gently. Set aside for 10-20 minutes to let the flavors blend. Just before serving add the cilantro leaves and 1/2 teaspoon of salt. Toss gently to mix. “Animal” is a 19-year old Indian boy who was disfigured as a result of a chemical plant explosion in his town when he was a small boy. The disaster caused his spine to become bent in such a manner that Animal is forced to walk on all fours. Since both his parents died in the incident, Animal is raised by nuns in an orphanage and also spends a good deal of time earning a living by running scams on the streets of Khaufpur. My story has to start with that night. I don’t remember anything about it, though I was there, nevertheless, it’s where my story has to start. When something big like that night happens, time divides into before and after, the before time breaks up into dreams, the dreams dissolve into darkness. That’s how it is here. All the world knows the name of Khaufpur, but no one knows how things were before those nights. “Animal” makes for an interesting if sometimes frustrating narrator. The text is full of his colorful language. Animal tells his story in a mix of English, Hindi, and French. His English and French are sometimes phonetically interpreted versions of the real word…for example he refers to spying on people as “jamisponding”, which he got from “James Bond”-ing. (don’t worry, if you don’t know any Hindi, there is a glossary in the back of the book). Just as Animal struggles with life in the aftermath of the disaster, the whole city struggles. There are major health and poverty issues throughout the city. Many of the people Animal interacts with lost loved ones after the explosion or have had negative health impacts. “Animal’s People” is a fictional story based on the real Union Carbide gas leak in Bhopal, India in 1984. The book is full of tragedy but has a good dose of black humor woven throughout. The book is a gritty read that will definitely leave a mark on you. I recommend this book to people who enjoyed any of Salman Rushdie’s books or A Fine Balance by Rohinton Mistry. Read with caution though if you are turned off by crude language and lewd thoughts or if you don’t enjoy books with lots of foreign words in the narrative. “Animal’s People” was shortlisted for the 2007 Booker Prize and was also listed as one of the 1001 Books to Read Before You Die. I don’t recall eating many lentils in the first 23 years of my life…and then I met the man who would become my husband. Since then I probably eat lentils on average about once a week. We love to cook them up to make a basic dal to serve with rice. 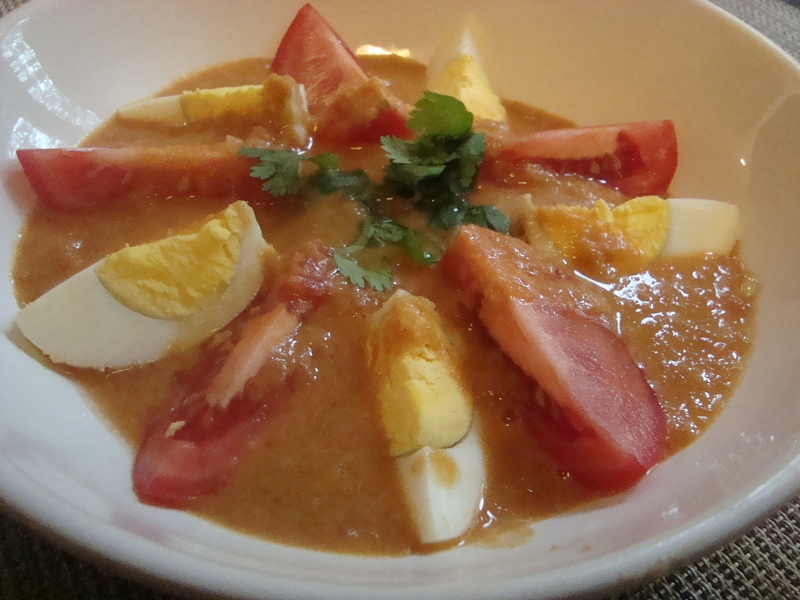 I came across this idea in an Indian cookbook…spiced lentils cooked with a touch of coconut milk and served atop wedges of hard-boiled eggs and tomatoes. Usually when I cook lentils, I don’t include coconut milk, otherwise most of the ingredients in this dal/lentil stew were similar to what I usually make. The coconut milk added just a hint of sweetness. I also liked the twist of spooning the lentils on top of tomatoes and eggs. Will definitely make this again! Heat oil in a saucepan. Add the onion, and gently fry for 3 minutes. Stir in the garlic, ginger, red pepper, and spices and cook gently stirring frequently for 1 minute. Stir in the lentils, stock, and tomatoes and bring to a boil. Reduce the heat, cover, and let simmer, stirring occasionally for 30 minutes or until the lentils are tender. Meanwhile, place the eggs in a saucepan of cold water and bring to a boil. Reduce the heat and let simmer for 10 minutes. Drain and cover immediately with cold water. Stir the coconut milk into the lentil mixture and season well with salt. Process the mixture in a blender or food processor until smooth. Return to the pan and heat through. I really liked them. 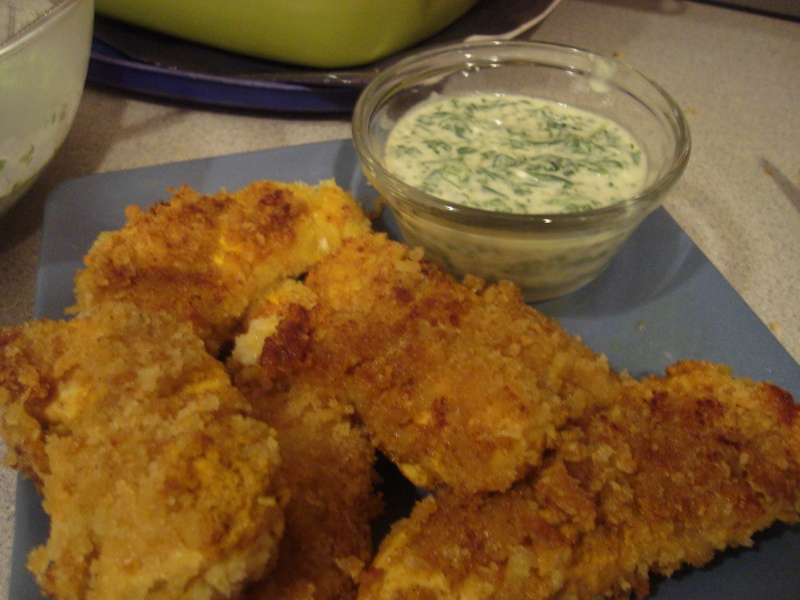 My husband voted that next time I should reduce the amount of panko on each tender. 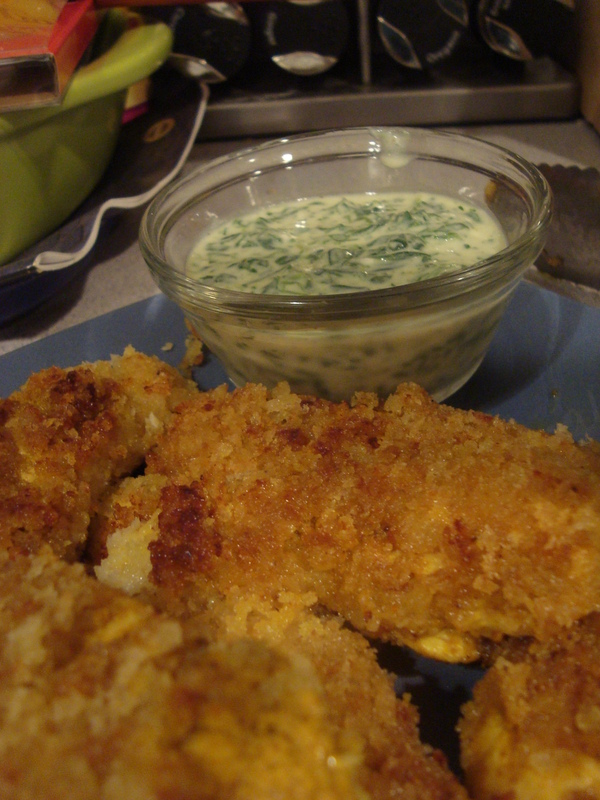 The superstar of the night though was the spinach raita (a super tasty spinach yogurt sauce) that we had to dip the tenders in. 1) In a small bowl, mix yogurt, salt, cumin, coriander, turmeric, garam masala, cayenne, garlic, and ginger. 2) Put tenders in a resealable plastic bag and add the yogurt mixture to the bag. Toss to coat the chicken. 3) Seal bag and marinate, refrigerated, at least 20 minutes and up to overnight. 4) When ready to cook chicken, remove tenders from marinade. Pour panko on to a plate and press tenders into panko, turning, until well coated. 5) Heat oil in large skillet until shimmering. Cook tenders, in batches if needed to avoid crowding, 3 to 4 minutes per side (or to 165 degrees). Add additional oil to pan as needed. Transfer tenders to a serving plate. Serve with naan or roti and spinach raita. I make raita all of the time. Raita is a yogurt sauce that is a favorite condiment in our household. Usually my raita is a pretty simple mix of plain yogurt, salt, and some masala spices. I decided to try this spinach raita recipe that I saw in a local supermarket flyer. It got rave reviews for its flavorfullness…and who can hate something with the added health benefit of spinach??? If you feed this to your kids they may not even notice the spinach…serve it as a dipping sauce for chicken tenders. 1) Heat oil in a large non stick skillet until shimmering. Add spinach and sprinkle with black pepper (vary amount depending upon your own personal preferences). Stir-fry until spinach is wilted, about 3 to 5 minutes. Remove spinach from pan. Cool and drain, then squeeze out excess moisture. Chop and set aside. 2) In food processor or blender, combine yogurt, cilantro, mint, salt, and cumin. Process until mixed. Transfer to a serving bowl. Stir in chopped spinach and refrigerate covered until ready to serve. We make kofta kebabs a lot in our household. Kofta kebobs are ground/minced meat mixed with spices and cooked up. A few months ago I posted about some chicken kofta in tomato sauce. My spousal unit would be in perma-nirvana-state if I made kofta kebabs multiple times a week. This particular recipe makes for a very bright and colorful presentation with the bell peppers, cherry tomatoes, pearl onions and chopped cilantro. The kebabs are moderately spicy, but if you are a spice-wimp you can reduce the amount of chili peppers and garam masala. We eat these kofta kebabs with roti or paratha (Indian flat breads). Blend together the ground turkey, onion, garam masala, garlic, green chilis, cilantro, salt and flour in a medium bowl. Use your hands to make sure that all of the ingredients are completely mixed. Form small handfuls of meat into small sausage shapes about 3-4 inches long and 1 inch wide. Brush the kebabs with 1 tablespoon of the oil and place under broiler for 12-15 minutes, turning and basting with oil occasionally, until they are evenly browned. Heat the remaining 3 tablespoons of the oil in a deep pan. Lower the heat slightly and add the whole baby onions. As soon as they start to darken, add the fresh chilis, bell pepper and cherry tomatoes. Add the kebabs to the onion and tomato mixture. Stire gently for about 3 minutes to heat them through. Transfer to a serving dish, and garnish with fresh cilantro.